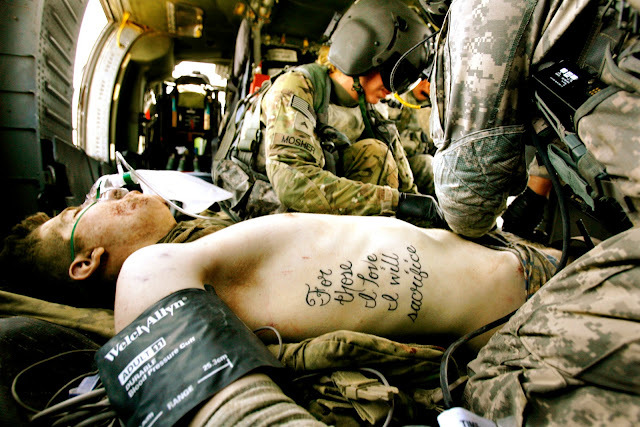 "For those I love I will sacrifice". You've seen the internet meme's, the tattoos, the online bravado. But did you know the story behind the guy that made the saying famous? I was curious so I looked into it and the bubba that lived up to the tattoo on his side is named Kyle Hockenberry of the 1st Infantry Division. Check out his story via Time (2011). Did you know Hockenberry lost both legs and his arm? I didn't. Bravado is part of the male psyche but I wonder. Do we (talking about you and I, definitely not Hockenberry) understand the power of the supposedly simple words we throw around like punchlines. I can't think of many phrases more powerful than the one Hockenberry had tattooed to his side.